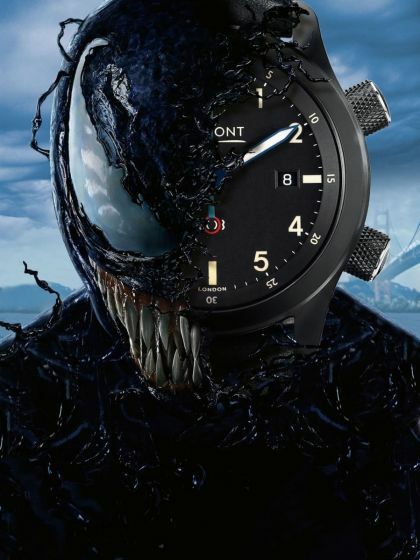 Fitting with the dark and sombre tone of the film, the new stealthy Bremont timepiece can be seen throughout adorning the wrist of Eddie Brock, played by friend of the brand, Tom Hardy. The U-2/51-JET takes design cues from some of Bremont’s military work commissioned by the RAF’s 100 squadron members to complement their Hawk T1 Jet aircraft. The 100 Squadron was the first squadron formed for night bombing back in 1917 and its stealthy appearance inspired this ‘Jet’ black timepiece complete with a black smoked glass case back. Stainless steel DLC Trip-Tick® case construction with Jet black barrel. Patented inner bidirectional Roto-Click® bezel operated by crown at 4H. Modified calibre 11 1/2’’’ BE-36AE automatic chronometer, 25 jewels, glucydur balance. Anachron balance spring, Nivaflex 1 mainspring, 28,800 bph, 38 hour power reserve, Bremont moulded and skeletised decorated rotor.